Better transit design through ... slime mold? 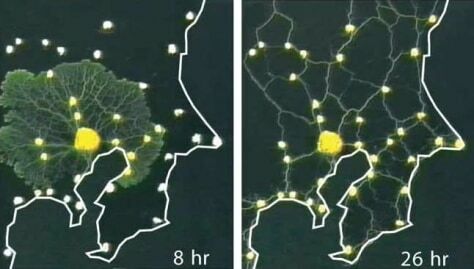 The left image shows slime mold growing out from an initial food source to colonize other food sources (white dots) arranged like a map of Tokyo rail stations. After 26 hours of growth, the mold resolved itself into a network of tubes that efficiently connected the food sources.